What an amazing experience. If you’re a regular here at DaniStevens.com you’ll know how much I love food and travel. So now imagine putting truly delicious food in a stunning location and inviting a bunch of interesting, lovely people to join the fun. A Moveable Feast is an innovative fresh concept in event dining. The inaugural event was in one of my favourite locations – the stunningly gorgeous Bondi Beach in Sydney. The look and theme was so Sydney – Pastel Beach Chic Champagne – and the direction brought out the last beautiful hues of the summer season out on show on Saturday, March 12 as tables of people enjoyed some delicious food and a party atmosphere right on the sand, kicking off at 6.30pm and relaxing into a delicious dinner feast that evolved into a fantastic party vibe until 11pm. You know me, I had to be the first person on the dance floor. PRESS PLAY. It was a fabulous setting to inspire romance so it made sense that tickets were sold in pairs but because each table was set up to seat 30 people, it moved beyond intimate romance and became a wonderful way to connect with old friends or meet new ones too. The food was delivered via a gourmet hamper, with choices to cater for vegetarians too. Ours was amazing and the menu by Lauren Murdoch had our tastebuds completely tantalised and excited. Just when you thought you’d eaten one of the most exquisite things EVER, the next course came and blew your mind even more. In the non-meaty version, the delights included kipfler potato, pea, celery heart and tarragon salad with edamame beans and finger lime, or marinated fetta, pickled pear, watermelon, rocket and pomegranate salad with candied walnuts, plus spice-roasted eggplant, eggplant caviar, green beans with chick peas, roast onions and hazelnuts. The wine was flowing as freely as the conversation and the live performance by Jake Meadows added another dimension of pleasure – especially as the sunset across the water and the food kept coming. Hearing harps with the backdrop of the ocean waves was amazing and I can’t wait to attend the winter and Halloween events. Indulgence is okay every now and then. I’m back to more basic flavours this week with my family – lots of juices (I just read about Gwenyth Paltrow's $200 morning juice with "moon dust", you know you can download mine for free and spend under $10 to drink #LikeABoss on a healthy budget! Grab your recipe here) and some focused exercise to make up for those extra treats I loved so much! Bravo to French man, Antoine Bessis, for creating an epic beach picnic on iconic Bondi beach. 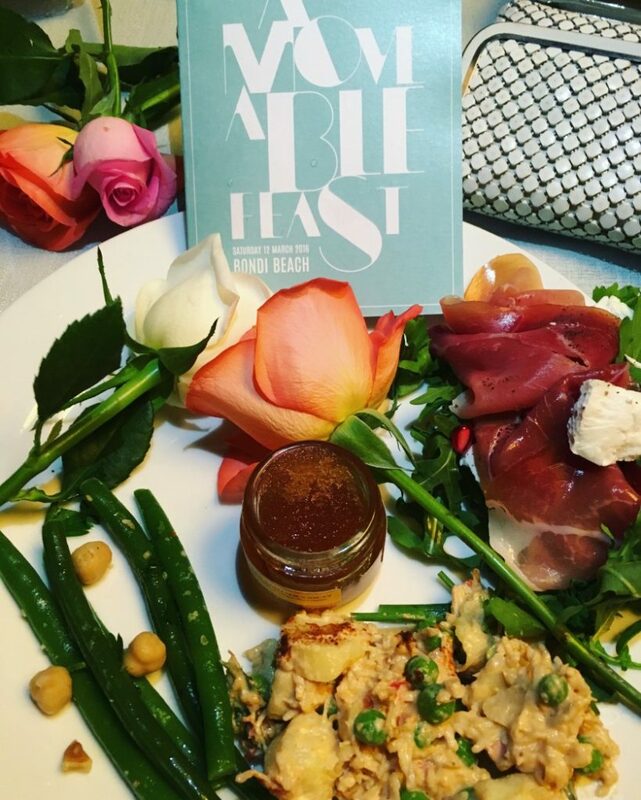 A Moveable Feast is one of my new favourite food events on my calendar this year. Maybe I’ll see you at the next one?